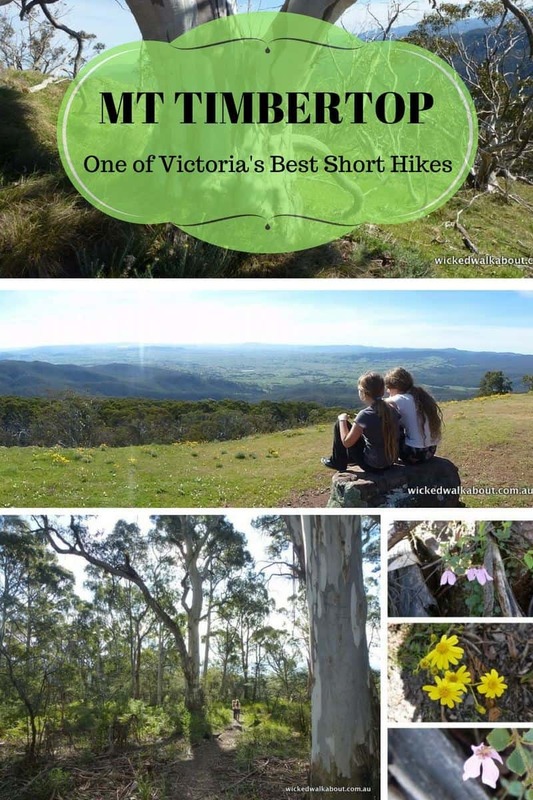 One of the ultimate short walks in the Victorian High Country region, highly recommended as a hike with kids. 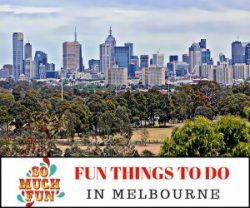 It could be done in a day out from Melbourne – long day out, though, so a 2 or 3-day trip would be best. 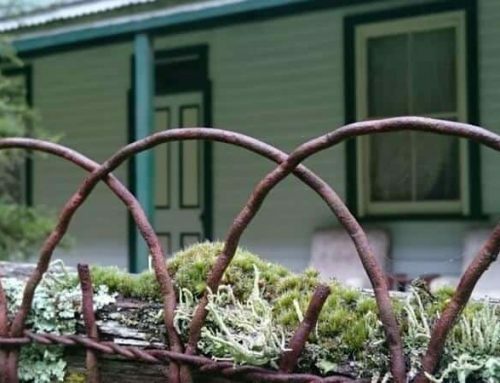 Head up via Mansfield, stay overnight in the Mansfield or Delatite Hotel, B&B or camp, and enjoy the ‘High country’ atmosphere! Signage indicates it is a 3.6km return walk, all uphill to the Timbertop summit and a good downhill return walk, on the same track. It is a super walk and not a huge distance. Anyone with moderate fitness should be able to enjoy it, kids who are used to walking shouldn’t find it too difficult. 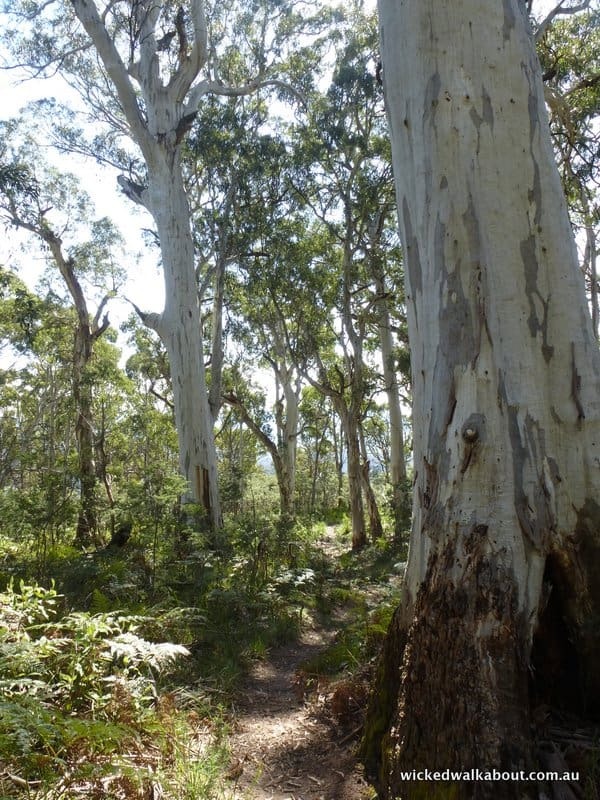 Camping is allowed on Timbertop and it is a dog-friendly walking track. 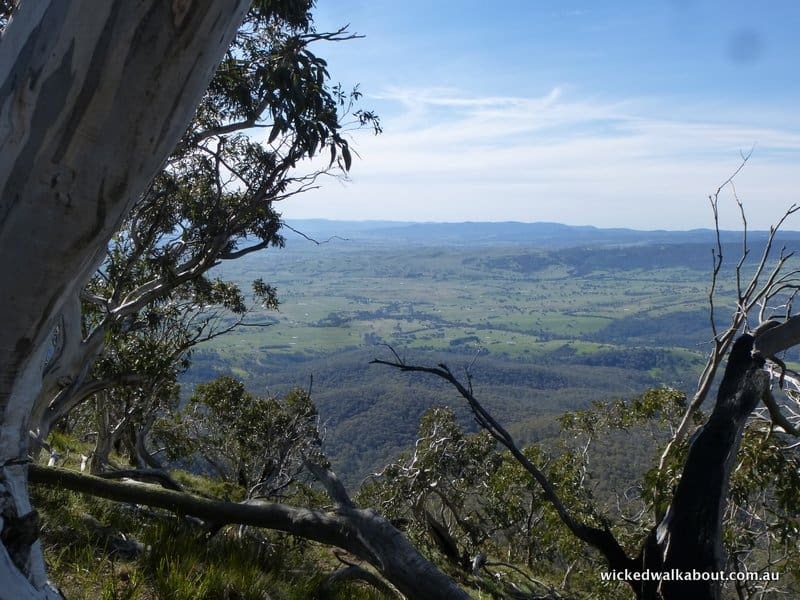 We recently completed this overnight hike with the kids, camping on top in hammocks and our ‘Speedy’ easy up, instant pop-up tent from Explore Planet Earth. enjoying roasting marshmallows around a small campfire. 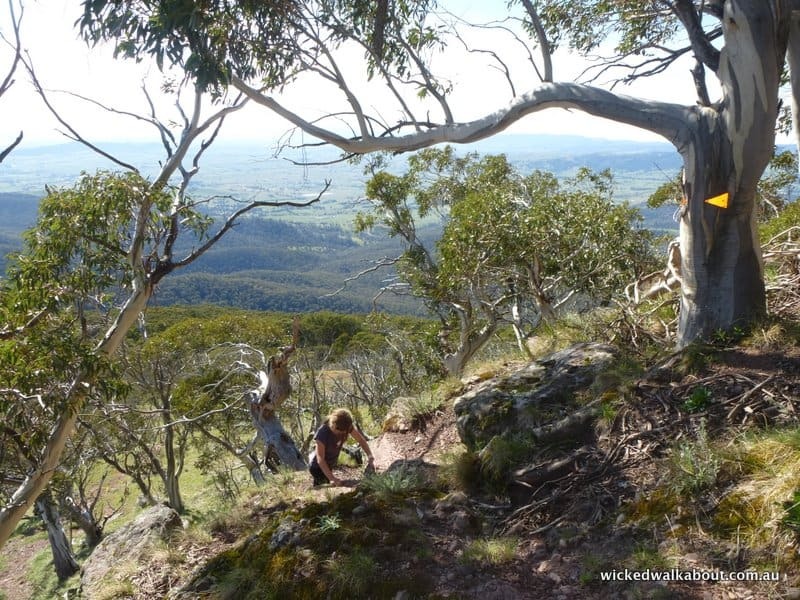 Camping on Mt Timbertop with Kids, dogs and Speedy Instant Pop-Up tent! This is not a designated campsite, no water or toilets etc., so a small shovel should be carried and all rubbish must be taken out again. It is possible to camp at the car park below, a better spot would be to drive on further and camp at Sheepyard Flats. 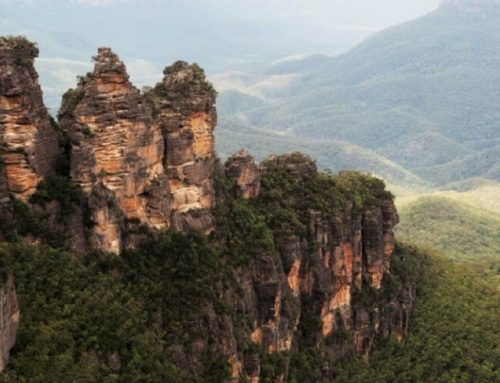 Another of our favourite places to camp with children, and it’s still free! 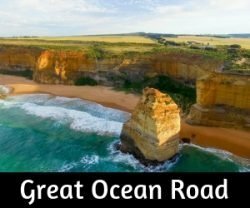 For anyone wishing to come to the area, but not to camp, there is plenty of accommodation in Mansfield and the surrounding area to choose from. The Delatite Hotel in Mansfield is a popular place to stay, many more hotels and resorts can be found using Booking.com which is a trusted way to find the best price for accommodation anywhere in the world. The Mansfield Holiday Park is a good budget alternative with onsite caravans, cabins and camping sites. A swimming pool and easy access to the town makes it a great choice. 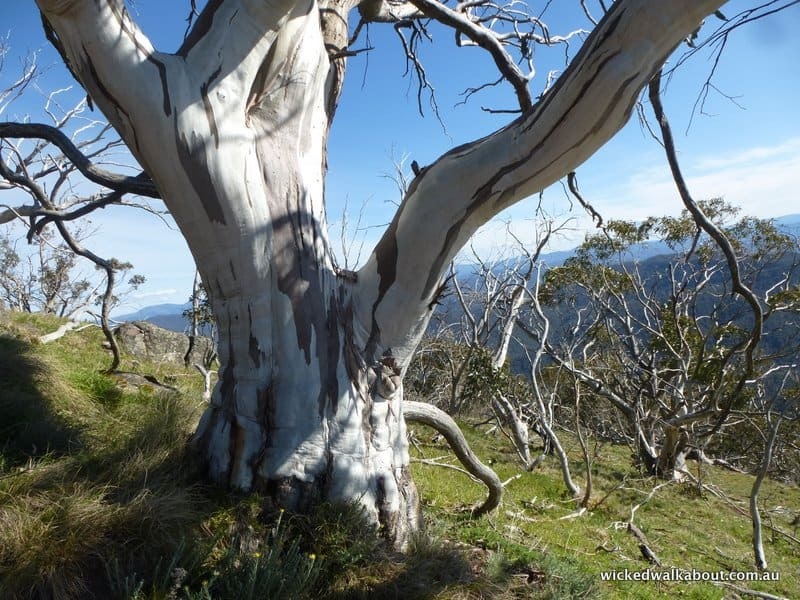 It is also popular choice during the snow season as the ski fields of Mt Buller are about 1 hour away. Merrijig is a great little speck of a town, with pub accommodation as well as B&B’s and cabins/cottages nearby. 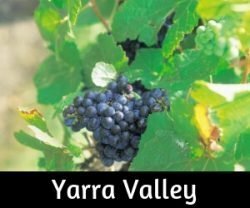 It is in the Delatite Valley, about 15 minutes from Mansfield and 15 minutes in the other direction to the base of the popular Alpine Resorts of Mt Buller and Mt Stirling. 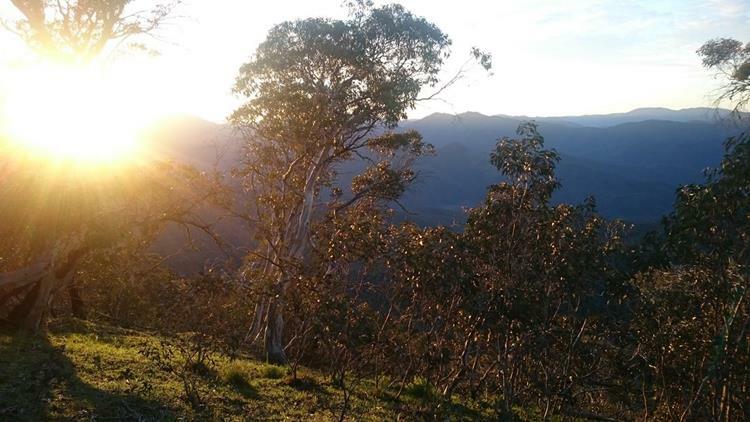 Mount Buller also offers some fabulous accommodation options. 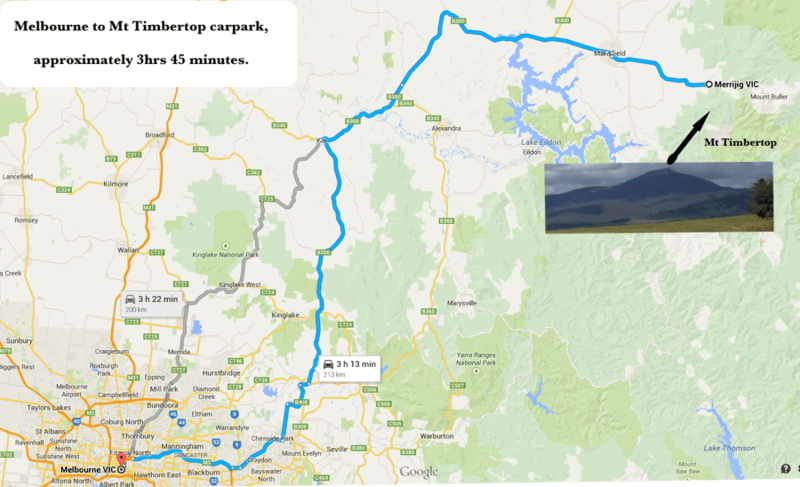 Starting at the Timbertop Saddle car park, the climb passes (up, up, up…) through Eucalypt forest for about 2 km’s before becoming an open alpine slope with expansive views across the valley to Mansfield in one direction, Lake Eildon in another and then across the Victorian High Country towards Mt Buller. 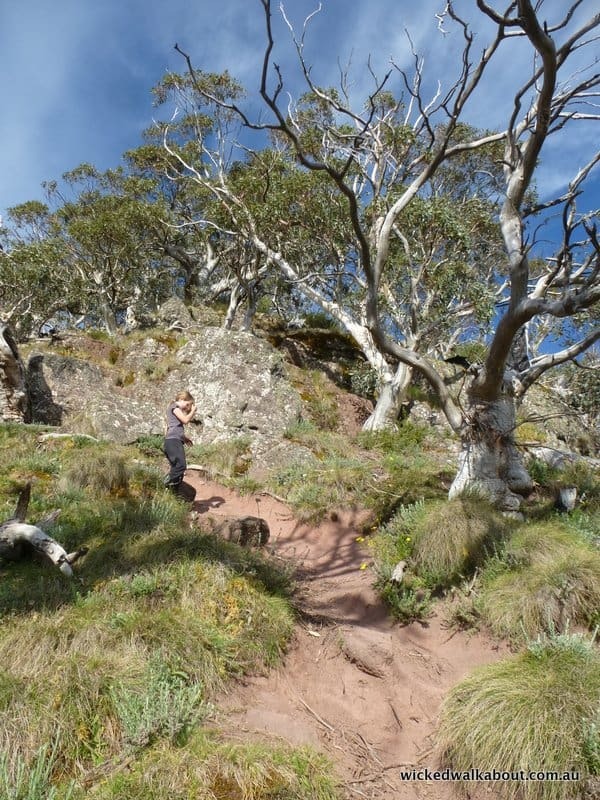 After a bit of a scramble up and over large rocks, the summit is accessible, 1275 metres above sea level. 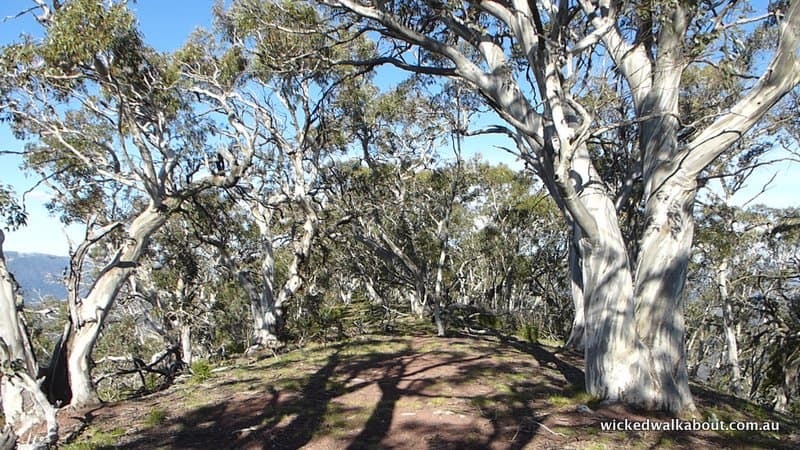 Beautiful snow gum trees (Eucalyptus Pauciflora) cover the top of Mt Timbertop, hence the name. 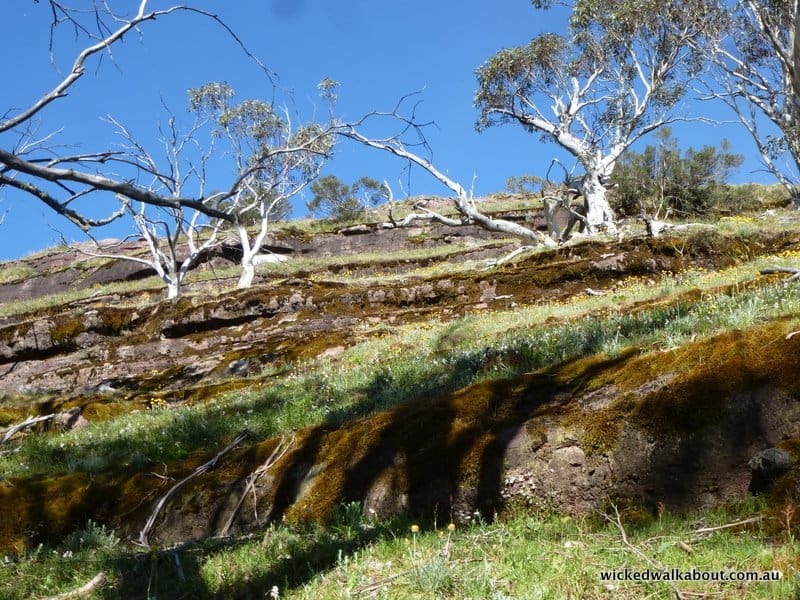 The ridge drops away gently on both sides and is about 200 metres long before heading down the other end with a trail that can be followed if a longer hike is preferred. 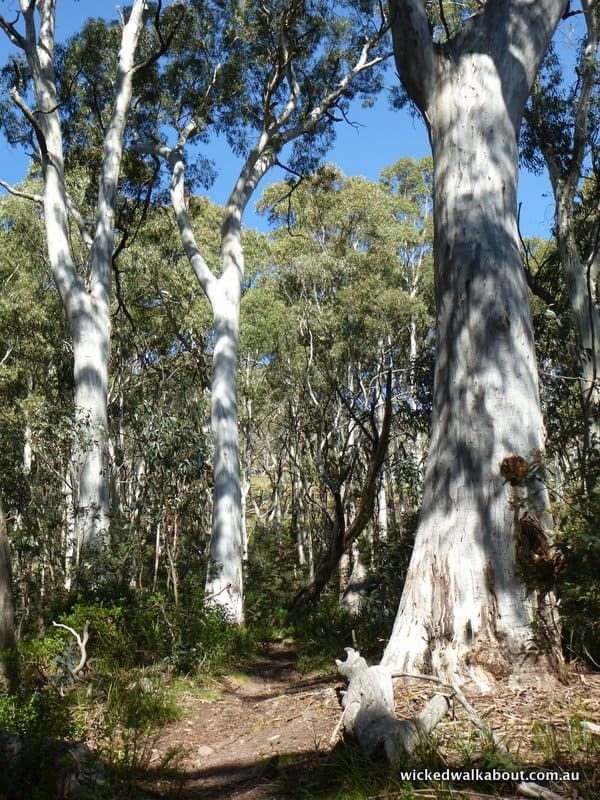 Collect a map and full directions from a hiking store, online or at the information centre in Mansfield. 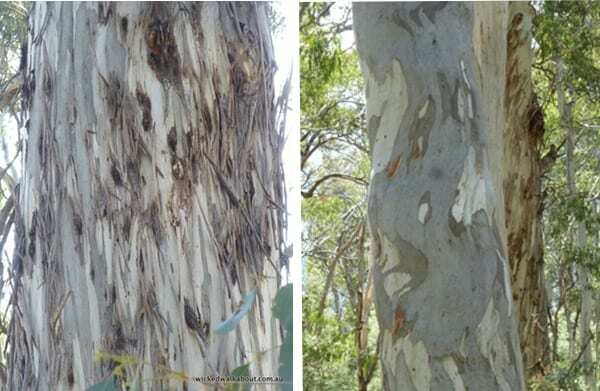 About half way up through the forested area, pretty colouring can be seen on the ‘candle bark’ gum trees (Eucalyptus rubida). 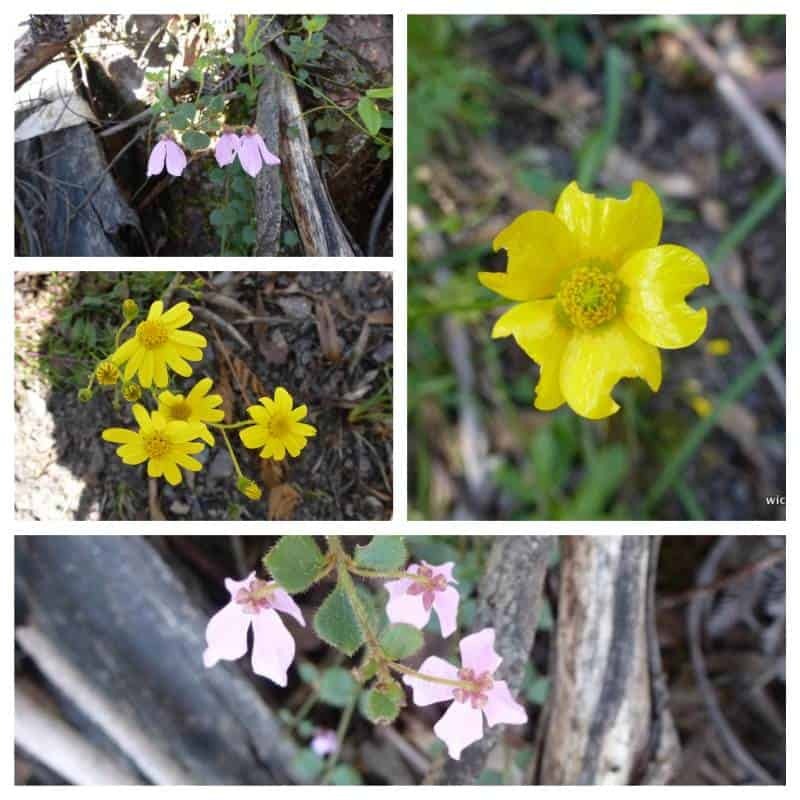 Pretty wildflowers can be seen along the trail and all the way to the summit, our walk was in mid spring time, so we saw a lot of flowers along the way. 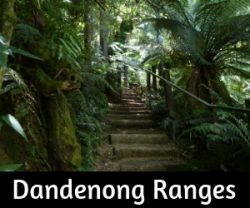 Through the forested area to the open Alpine slopes, easy enough walking via the trail. Stop a while and enjoy the views of the valley and mountains. This view is looking back towards Mansfield. If you do this walk, have a seat on the rock, take a photo or two or more… and add it to our Facebook page! A final scramble up the rocks to the summit. Kids will either fly off ahead at this point or need help getting over the rocks! The Summit of Mt Timbertop! 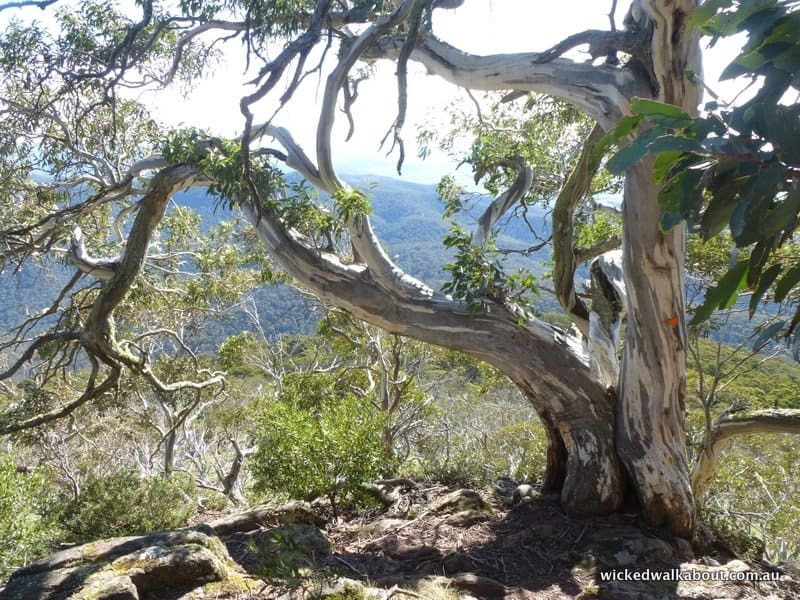 A smashing spot to enjoy lunch or a snack – be sure to pack some food and water to keep everyone happy if you are hiking with kids! Once we were on the summit and had hung the hammocks, the girls understood why I was so keen to camp up there for the night. It was a great way to chill for the afternoon and enjoy the scenery. So close to civilisation, yet so far removed! 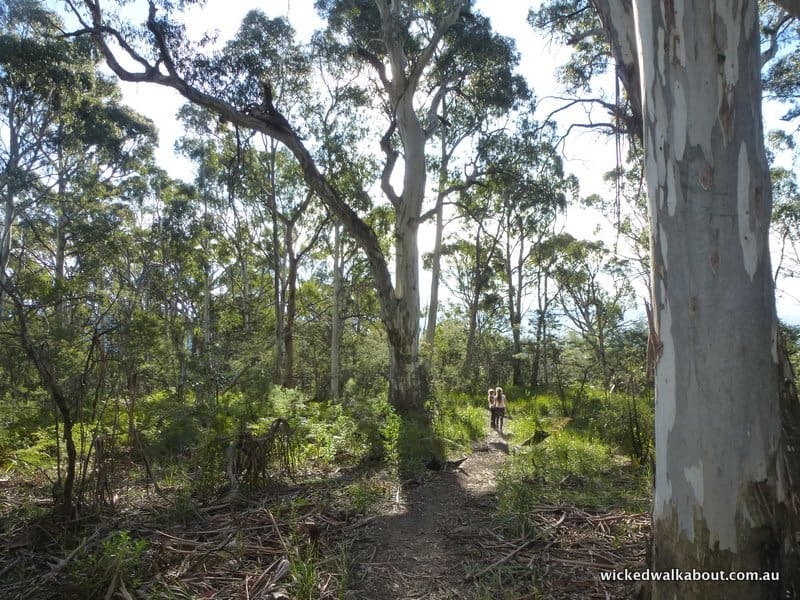 Whether it is a day hike or a campout, Timbertop is one of the Ultimate Short walks in Victoria! 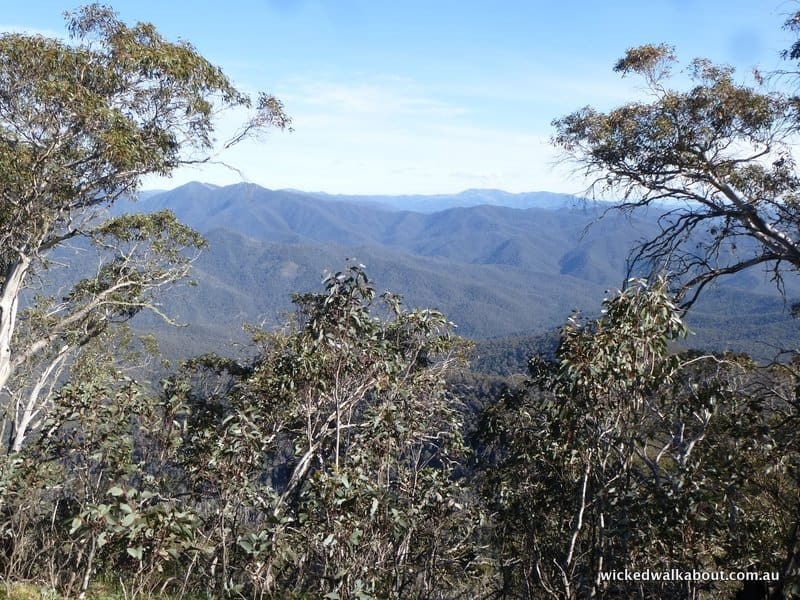 Climb Mt Timbertop, Prince Charles probably did too! 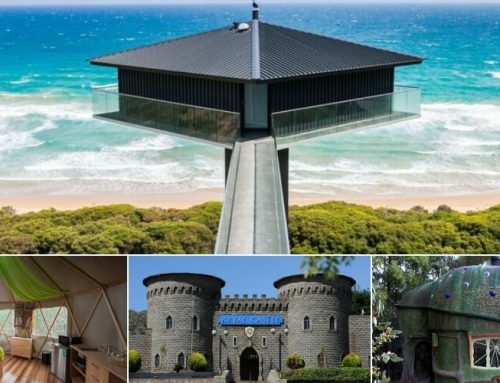 Close to this superb area, Australia’s Geelong Grammar School has an outdoor education centre that Prince Charles attended as a school boy, the campus is called Timbertop. “Prince Charles’ first trip to Australia was to attend Geelong Grammar’s Timbertop school from 30 January to 1 August 1966″. 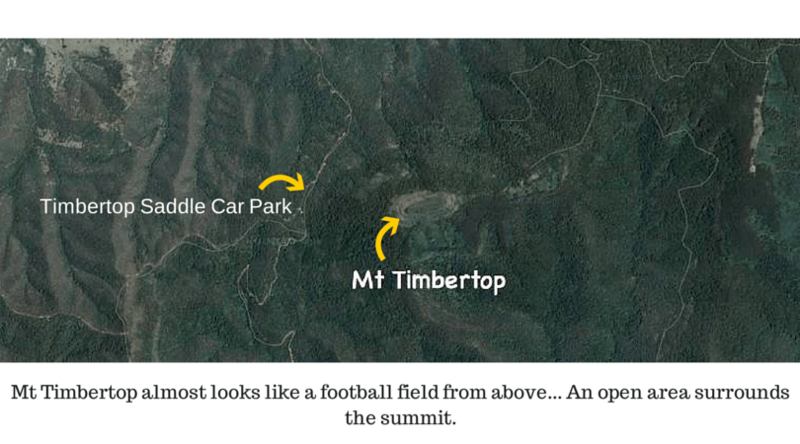 Have you climbed Mt Timbertop, Mount Buller or hiked any of the nearby trails? Let us know in the comments section below and share your highlights! What a lovely walk! The hammocks are such a great idea. Thanks Taylor, Congratulations on being a finalist in the awards! !